Buon giorno. 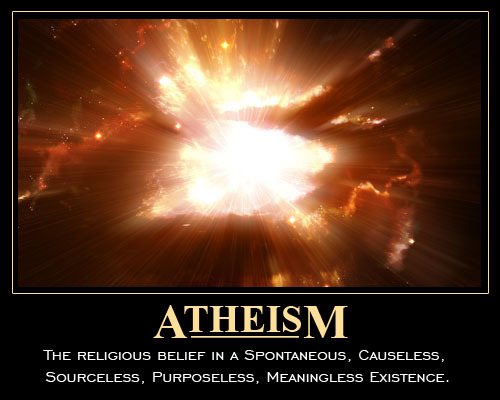 Normally, I save this atheist stuff for the weekends, but I plan on being busy. Whaddya think? Should I just drop the atheist stuff next year? On one hand, they're boring and predictable with their absence of critical thinking. On the other hand, I get amazed at the lack of reasoning ability and the vituperative hate. No link, the original was deleted. Isn't that precious? He cares because he thinks that "religious" people will do stupid things. He's committing the Fallacy of Composition. Yeah, gotta watch out for those "religious" types, can't have the Amish crashing their buggies into crowded bus stations or something. And we can't have "religious" people building schools and hospitals, or ministering to the poor — you know, those things that you don't see atheist groups doing. One of the problems I have with modern Internet atheists is that they use their "reason" and "logic" by (to use the technical term) making stuff up. The other "big thing" they do is another fallacy, wishfully thinking that if they assert something, it will magically become true. Norman the Paranoid Troll was great at these, he was full of accusations and hate in his rambling, nonsensical "writings". 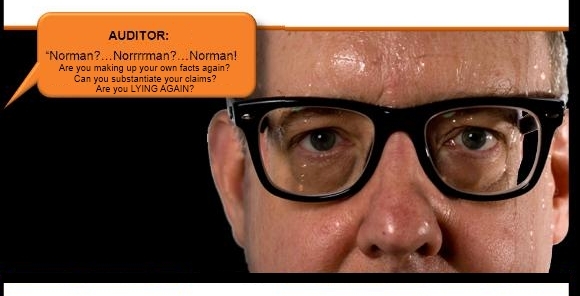 Norman is right because he said so! He did not document things correctly (the few times he documented anything), and was guilty of libel and defamation. Yes, I've documented it. Don't want to be like those other people and leave it undocumented, capice? Many atheists have been guilty of libel, slander, illegally recording calls and more, but I digress. My old pal Matt Slick of CARM (ask him about me, he'll say, "Oh, him!") was doing hate mail. He "amps it up" for those times (usually on Fridays) and indulges in silly voices and rants. This one was good (and very similar to material I have received, almost verbatim in some places), showing atheist intolerance, smugness, arrogance, presuppositions, anger, hate and fallacies. Count 'em. Videos - What Do You Call That Holiday on December 25? OK, Gang! Two videos, one song. Buon giorno. I have a post up at Piltdown Superman that is not scientific, but more philosophical. You can read that here. Thanks to Answering Muslims, who mentioned this story earlier. More of the "religion of peace" in action. Read the rest of "NEWS ALERT: Nigeria Militants Kill Children Of Christian Convert, Missionaries Say", here. Buon giorno. Every year, atheists and "humanists" (those are atheists who want legal standing as a religion) ramp up their attacks on Christmas. The 2011 attacks have already started, but this time, they're playing the "discrimination" card. (Some complain of discrimination in employment and in other places where it is illegal to ask, or make a prerequisite for employment, someone's worldview. News flash, Poindexter: Clam up. You either offered this irrelevant information as a matter of pride, or the discrimination probably did not happen.) 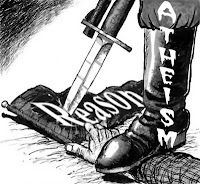 With the growing snarling of atheists, their antics to interfere with the rights, sensibilities and beliefs of the majority of the people — how can anyone honestly wonder why atheists are the least trusted and least respected "minority" in the country? [1,2] (Edit: In my experience, and in the experience of others to whom I have spoken, atheists are also the least honest people.) It must be something to be ranked at the bottom with radical Mohammedans, who hate Christians as much as you do! These atheists pretend that they are the victims of discrimination, but let's be honest: They are the instigators of extreme religious bigotry. 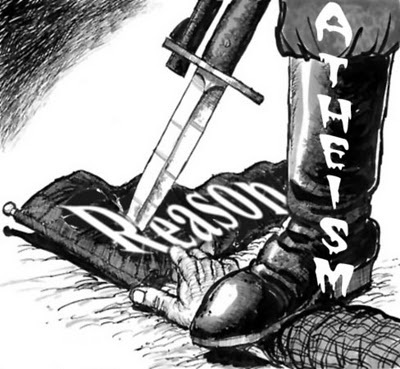 The obstreperous atheists are gaining power. What happens when atheists control countries? They force their ideologies on others, killing and imprisoning dissenters. I have a few articles about present-day atheist regimes for your perusal. You may want to click around the sites linked below and see other stories of persecution. Chinese Pastor Zhang Rongliang, also known as Uncle Z, reports that the seven years and six months he spent in prison were a fruitful time of ministry. Zhang is still recovering from severe health problems after completing his full sentence on Aug. 31, 2011. He was immediately admitted to a hospital for 15 days where doctors monitored Zhang’s high blood pressure and diabetes. In early December 2004 Zhang disappeared, and eventually, the Chinese government admitted they had him in custody. Zhang was sentenced to seven years and six months in prison for possessing and using a forged passport — which typically carries a six-month sentence. People and organizations around the world pressured Chinese Communist leaders to release Zhang. Thousands of individuals wrote letters and prayed while multiple organizations worked to secure his release. Read the rest of "Pastor: Happy You Failed" here. Maoist rebels in Nepal attacked Christians at an evening prayer meeting, according to VOM contacts. The rebels ordered them to stop the meeting and then assaulted the pastor and believers when they refused. Before the attack, the pastor had asked the Maoists to leave and return the next day to talk with him, but the rebels instead began to beat him with sticks. When church members, including the pastor’s father and women in the church, tried to defend the pastor, the Maoists attacked them, too. The rebels also burned Bibles and hymnals during the attack. Read the rest of "Pastor Beaten by Maoists" here. After a few months' break, Belarusian authorities have resumed punishing leaders of the Baptist Council of Churches, whose congregations refuse on principle to gain the state registration which officials insist is compulsory. In the third court case in 2011, Pastor Aleksei Abramovich, who leads their congregation in Zhodino in Minsk Region, was fined several weeks' average local wages in late September, Council of Churches Baptists told Forum 18 News Service. Meanwhile, another Protestant church in Zhodino has been repeatedly denied registration because no local enterprise is willing to give it a legal address, while architectural officials will not approve their newly-built church. Eight Jehovah's Witness congregations across Belarus, as well as non-Moscow Patriarchate Orthodox congregations are among other religious communities currently unable to get state registration, Forum 18 notes. Their religious activity is at risk of raids and punishment at any time. Read the rest of "Belarus Punishes Pastor For Worship Service At His House" here. Read the rest of "Persecution Increases" here. But first, throw away those loathsome Che Guevara T-shirts and flags. They're sickening to decent people, capice? Fourteen Khmu Christian families in Laos are standing strong in their faith, despite the Communist government forcing them to relocate to another village and their homes and church building being destroyed, according to The Voice of the Martyrs contacts. In 2003, the families were evicted by the government and relocated to another village where they were moved again. "After these 14 families stayed at this village for a year, the Communist Party members of the village found out that the head of the village loved them," VOM contacts said. "[The village leader] even allowed them to build a bamboo church on his land." The Communist district governor was not happy with the head of the village. "... [The] governor kicked him out from his post and then replaced [him] with another man. The new head of the village started persecuting them from 2006 to 2009," VOM contacts report. The leader refused to allow them to register, making them illegal residents and he stopped them from farming land, the contacts said. Read the rest of "Christians Stand Firm" here. Forum 18 News reports that on Aug. 20, New Life Full Gospel Church in Minsk, Moscow [district], was issued an eviction notice by government officials, forcing them to abandon their church building purchased in 2002. Government authorities have not disclosed why the church is being evicted, but have repeatedly refused to grant the church’s application for registration. In 2002, Belarus passed a restrictive religion law that made all unregistered religious activity illegal. Read the rest of "Church Evicted" here. Three Christians seriously injured during a savage attack near Hanoi on Nov. 13 have been evacuated to an undisclosed hospital in Ho Chi Minh City after several hospitals in the region refused to examine and treat them. The attack on a church leaders’ worship service of an Agape Baptist Church (ABC) house church in Lai Tao village, Bot Xuyen commune, My Duc district left one woman, evangelist Nguyen Thi Lan, with her pelvis broken in two places and with badly damaged internal organs, according to doctors who recommended emergency surgery. Yet previously doctors at three area hospitals had told her and two other seriously injured Christians that they were fine and dismissed them, said Pastor Nguyen Cong Thanh, head of the ABC. When doctors in Vietnam learn that religious motives play a role in violence, commonly they do not dare to treat or even examine the victims of persecution. Read the rest of "Christians Injured in Attack in Vietnam Denied Medical Care" here. Click here to obtain a free copy of "Tortured for Christ". Information scientist, author and evangelist, Dr Werner Gitt, a close friend of CMI, told us that on 23 October 2008 he was subjected to the most strident opposition he had ever encountered. The venue was the Audimax theatre at the Leibniz University in Hannover, Germany. Dr Gitt had been invited to give a lecture by the Forum Bibel-Glaube-Wissenschaft (Forum of Bible-Faith-Science). The talk was titled, ‘Why I as a scientist believe the Bible’. The 600-seat auditorium was packed to overflowing for his address, with some seated in the aisles. Just as Werner was about to commence his lecture, he told us, about 40 students began to disrupt the event. Most were part of a large group at the back, while several individuals had positioned themselves strategically throughout the room. Read the rest of "Go to Hell, Creationists" here. If God Doesn't Exist, Why Do Atheists Hate Him So Much? Buona sera. On one hand, atheism has been redefined from "belief there is no god or gods" to, "lack of belief" (probably changed because they were humiliated in philosophical discussions) . Well, why does someone's "lack of belief" motivate them to attack God, the Bible and Christians? Not just snorting in disdain and walking away, but vicious, personal attacks. If they weren't so stupidified by their hatred, they might ask themselves the same questions. Also, it is hypocritical to claim that God does not exist (another inconsistency on the part of people who "lack belief"), but devote Weblogs, books, book reviews, hours of trolling and such to attack him and his people. If he does not exist, then leave it alone, capice? But no, they want it both ways. Recently, I have had a lot of conversations with atheists. Many express a strong hatred of God. I have been at a loss to explain this. How can you hate someone you don’t believe in? Why the hostility? If God does not exist, shouldn’t atheists just relax and seek a good time before they become plant food? Why should it matter if people believe in God? 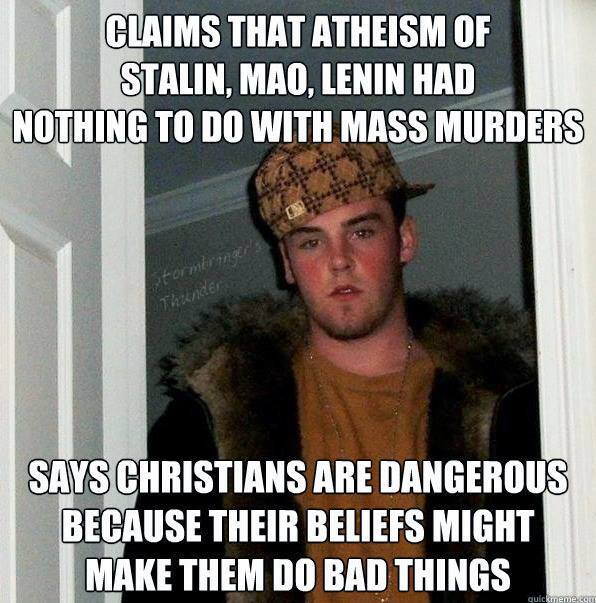 Nothing matters if atheism is true. Read the rest of "Why Do Atheists Hate God?" here. This logical fallacy is difficult to classify in some ways because of the huge potential for blending and overlapping with other fallacies (especially ad hominem). Appeal to Ridicule is a form or subclass of the Appeal to Emotion fallacy, and is often used as a kind of Red Herring to distract the opponent from the topic under discussion. Creation science is stupid. This is the "purest" form of the fallacy, where the topic is directly ridiculed. You must be an idiot fascist because you believe in God, and religion is stupid. Now you can see an ad hominem attack mixed with the ridicule. Intelligent design is stupid and unscientific because it's just "Goddidit". A Straw Man fallacy is mixed with the ridicule. The emotional aspect of an Appeal to Ridicule can be powerful. If you are not on guard against it, you can find yourself hopelessly chasing a school of red herring to nowhere. And getting angry. You could find yourself defending your intelligence and personal integrity instead of having your opponent justify his assertions. (I have seen attacks that reek of desperation by jumping on typos, mixed metaphors or grammar instead of dealing with the point at hand.) And if you're distracted from your subject, the simple act of wasting your time is a sort of victory for your opponent, you savvy? Ridiculing your topic is not necessarily ridiculing you, but wait a while; the personal attack will not be far behind. I know it is easy for me to say, but try to maintain your composure and stay with the topic at hand. Of course, if your discussion is adversarial and unproductive, feel free to withdraw. This has multiple fallacies, including loaded terminology as well as ridicule. Pathetic. — Chris DeBurgh, "Don't Pay the Ferryman"
Buon giorno. I did some bad logic. Yes, I know it's astonishing. But your astonishment will evaporate when I tell you that it was on purpose. The question itself is biased. Then, the first two answer choices contained loaded wording. The third selection was legitimate, and the last two were because I wanted to be funny (I was the only one to vote on "Sorry, what?"). If I worked for a pollster, I would have been sacked. In the article, I pointed out my dealings with some of those people in this "show" included manipulation, personal attacks, ridicule, profanity and fundamentally flawed logic. They must think that I am stupid, because I am still badgered to be on the "show", even though I have repeatedly explained my reasons for refusal. Further, continued attempts at manipulation and appeal to pride ("Come on the show, prove you're not a Poe") reinforce my belief that they have no respect for my intelligence, beliefs or for me as a person. By the way, the "prove that I'm not a Poe" nonsense can easily be turned around because atheists have their own Poes. News flash, guys! Ridicule is not a form of logical discussion! Another reason that this poll was spurious is because I never intended to participate. But then, I never claimed that I would abide by the results of the poll. Which is a good thing, because it was obviously manipulated by these guys and their pals. I received e-mails strongly imploring me not to do this thing ("Don't waste your breath nor fingers as no good can come from that situation"..."I voted for "leave it alone". As I was doing so I noticed "38 votes so far" and thought, "Hey, that's pretty good." And when the results appeared I could see that 26 of those votes are from your creepazoid stalkers. They really want you, baby! Take my advice, it'll be better for your blood pressure. I can feel mine going up just thinking about it"), and personal conversations strongly advising me to give it a miss. Something I forgot to mention in the previous article is that I had no idea how many atheists I would be facing, and what topics. (I was told much later by the one who is actually civil that it would be one-on-one, and I could choose the topic. Aside from my trust level being zero, I have the larger concern of being unable to see much value in the whole thing, aside from making their CV look good.) I'm not Matt Slick, James White (not every show takes calls) or Greg Koukl, ready and willing to take on just about anything in a cold call. One of these atheopaths has humiliated himself on Matt's show, I'd love to hear him try his stunts with Greg or Dr. White. Tee hee. I had some extra knowledge that I chose not to mention in the other article: The reputation of these guys who want me to call and "debate" on their "show". I told of my experiences with some of them, but what about people who have actually listened to this thing? "Tribalogue" had some interesting comments, plus a follow-up. So did "Grace in the Triad". (Unfortunately, I had to remove the links to the above material that existed when I made my decision.) Also, I asked someone who had actually endured this "show", and was told, "Don't do it". Edit: This arrived in my e-mail: "I am glad that you have decided against appearing on the Fundamentally Flawed podcast with host Alex Botten. After having done a bit of homework on the man and observing him at various blogs on the internet, I have come to the realization that Botten is a sickening and exceedingly wicked man. He is not merely incoherent and irrational—although he is that—but a truly wicked and disturbed man who relishes in his feculent sin." 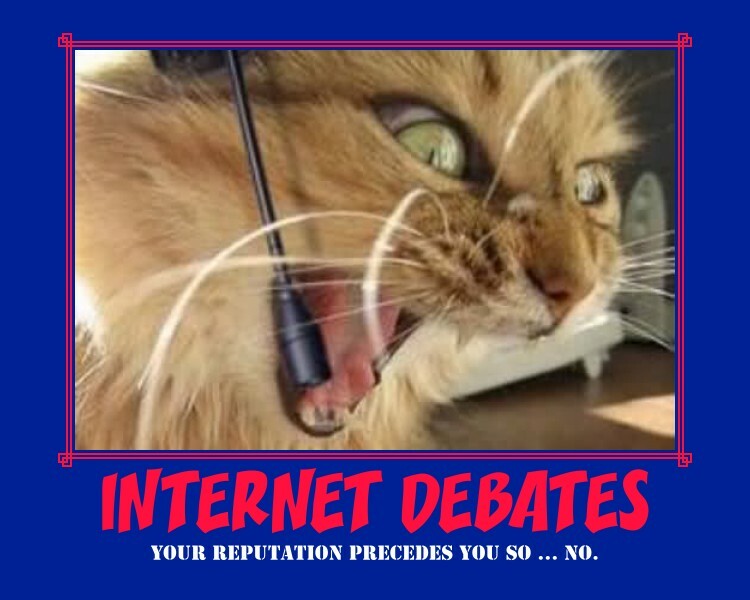 After the poll was closed, I received an e-mail wanting to set up the debate that I had never promised to do. All these attempts at manipulation are off-putting, to say the least. If they had started out acting respectfully and being skilful, they could possibly have built up a decent reputation by now. I wonder if they will ever change? Nah. Hate makes people act stupidly, and think irrationally. You can see Alex Botten's lack of logic, lack of civility, lack of understanding the basics of copyright law, lack of willingness to follow the Terms of Service of Wordpress, lack of respect for the rights and sensibilities of others here. I'm glad you asked. There were three. First, I vented a bit. Second, to give other potential callers some information on which to base their decisions to participate. Third, and most important, to discuss how my previous write-up was skewed with loaded terminology; it is an example of the kind of thing that should be approached with caution when it is presented as "objective". 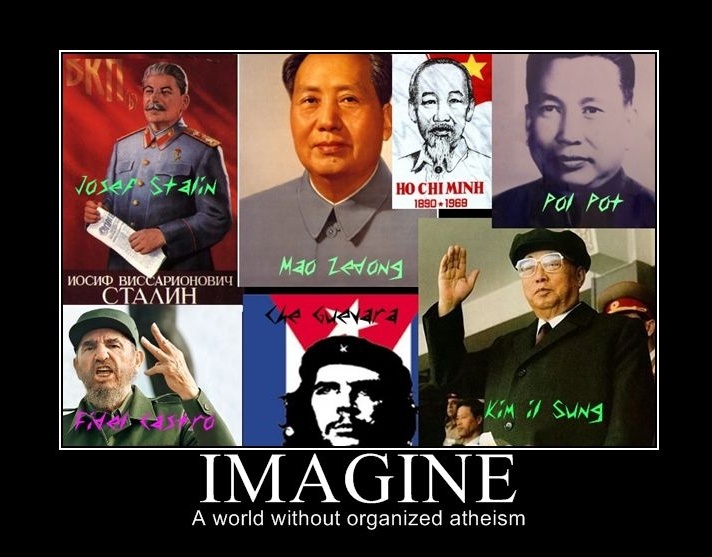 Is Atheism Another Form of Satanism? Buon giorno. I called Matt Slick of CARM on his radio show, and we had a rambling discussion as if we were old pals. In this edited excerpt, I took out tangents, some pauses and nonessentials that detract from the discussion. Matt and I were both enjoying the topics, and we covered a great deal of ground. The items discussed in the clip include Matt teaching me a new word ("sesquipedalian"), the logical fallacies of evolutionists and atheists, their blind faith remarks, bad evidence (like Lamarckianism and the Miller Experiment) and the demonic influence on atheists. I pointed out that one of the foundational points of the LaVey version of Satanism is selfishness. Also, the sin of Lucifer was pride. Obviously, selfishness and pride go well together, and modern arrogant atheists are saturated with pride. This leads to further sin, and to "stupidification" (that is, blind hate and sin make people stupid and they cannot reason; how else can someone justify the attitude that attacking the individual or the God he or she serves is equal to a logical argument, capice?). Then the conversation went to minority positions like atheism, Islam and homosexuality gaining power and imposing their will on others. I have to add a comment about a remark I made in the broadcast, and at the top of this page. Ready? Good. There is dispute about Aleister Crowley being a Satanist or not, and the actual meaning of the quote. Some claim that it is simply about the Thelema religion that he manufactured, and it means, "Follow your own path". Sorry, Seymour, it still strikes me as a proclamation of selfishness; if he had meant "follow your own path", then he could have simply said that. Sounds like a grand awful mess, I know, but it will make more sense after you hear it. Since DivShare failed again, here is the MP3 download link (ignore the "unable to play" error). Here is a link to the entire show. A video at the "Answering Muslims" Weblog, plus references from the Koran, the Hadith, Mohammedan commentaries, the Sira and links. Through the centuries, thousands of people have claimed to be prophets. 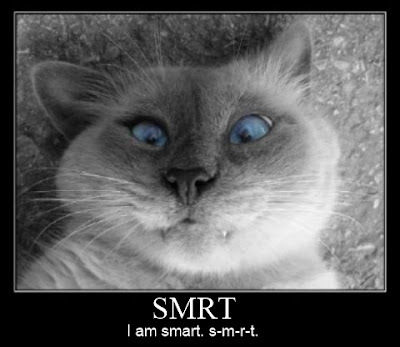 Only one, however, rested his claims on the fact that his aorta hadn't been cut. Ironically, as this man lay dying, he confessed that he could feel his aorta being severed. Click here for the video, references and comments. Buona sera. Every once in a while, I talk about equivocation. It is a way of blurring the meanings of words by assigning definitions. For instance, microevolution is true. It is variations within species but not breaking away from the limits imposed by genetic information. Macroevolution is not true, "goo to you" changes lead to entirely new creatures. When someone says, "Evolution is observed all the time", sure, but only on the small scale. To try to convince you that evolution happens on a large scale because it is observed on a small scale is an example of equivocation. Atheists tend to use equivocation regarding Christianity. Is it their fault? In some ways yes, and in some ways no. The Bible is supposed to be the foundation for Christian faith and practice. The Catholic church uses the Bible to some extent, but also mixes in traditions, rituals, man-made rules &c. In addition, the Catholic church is the oldest and most populous of religions going under the name "Christian". When an atheist, skeptic or other unbeliever sees someone in the Roman Catholic belief system practicing his or her religion, this unbeliever may think that such practice is common to all who claim to be Christians; this is where the equivocation occurs. Catholics are not typical representatives of Christendom. In fact, since there are about a billion people who call themselves Catholic, there are unique practices in various countries, cities, churches and individuals. I said before that unbelievers are not entirely at fault for equivocating activities under the guise of Roman Catholicism as representative of all Christianity. That is because of the size and age of the religion; they can't help but do some equivocation. And yet, they are at fault if they continue to assume that all Christians believe and practice like that oddball Catholic that lives down the street; do a little research and engage in some scientific method and see that all Christians are not the same. Sometimes, people have beliefs that I honestly wonder would be embarrassing to the Vatican. I say this because some of the things I come across are not only completely un-Biblical, but seem more like pagan superstitions or wishful thinking. No wonder some of you laugh. Just remember, many of us who call ourselves Christians are more interested in following the teachings of the Bible, and not strange, pseudo-Catholic e-mails. Buona sera. Here's another public service from Stormbringer Productions. My burn phone received a text message from someone I do not know. I don't like that. It's a burn phone, for crying out loud, and I don't want many people to have the number, capice? Besides, this kind is a pay-per-minute thing. So, what to my wondering eyes did appear? A miniature message from 1-702-683-4036: "Today we can let you borrow 1000.00! Its easy and takes 5 minutes to get approved by a licensed lender-www.[fuggedaboudit].com." I got Hal the Hacker involved, and he saw that it came from a wireless caller in or near Las Vegas. (Also called "Lost Wages", and that's exactly what this jerk is trying to do to my wages.) As near as we can figure it, this bunch of spammers grab several burn phones, spam out text messages to send you to their Website. No need for them to worry about getting their accounts deleted, because their dirty work is done and they just move on to another lot of cheap burn phones. Well, you're warned. You may even want to do a preemptive block on 1-702-683-4036 so you don't get bothered. But then, that number may be trashed already. Piltdown Superman wants to sic his pet Archaeoraptor on them. I should let him. No More Girl Scout Cookies for Me! Buona sera. It's sad, really. There are some organizations that we were able to rely on to help develop the skills and character of our young people. Since the rise of the "anything goes", tolerance, politically correct, drift to moral liberalism and political leftism, we have to check everyone, it seems. The Girl Scouts of the USA has lost its focus. Not only will they allow boys who are sexually confused (mostly from lousy parenting) to join their ranks, but their continual journey to the left is becoming alarming, to say the least. Their November 2011 convention is full of extreme leftists, including pro-abortionists, lesbians and other femi-nazis. Since GSUSA is hypocritical about the values they claim to support, girls are feeling betrayed and are leaving the organization. The Girl Scouts organization needs to face some very tough questions. Here are some questions that girls and their parents can ask to see if GSUSA is really the kind of outfit that they want their girls associating with. Fortunately for the Christians in the GSUSA, there are similar groups available through churches. Unfortunately, they are not as well funded and unified. Still, these girls are not as likely to be indoctrinated in leftist "values". This can also be a wake-up call to parents to instill strong values in their children, and not rely on disingenuous organizations and the schools to do this part of their work. Don't ask me to buy the cookies, because I cannot support leftist indoctrination projects, capice? Credit where it's due, VCY America's "Crosstalk" program put me on to this topic. Buona sera. Have you ever noticed that the people who make the most noise about "tolerance" are the least tolerant? There are two problems with their views. First, "tolerance" has been redefined. In normal use in the context of viewpoints, we can tolerate other people's opinions and values, respect their right to have them. There is no shooting, shouting, ridicule, browbeating, Internet trolling and so forth. We may discuss our differences, we may not. Now the redefinition of tolerance has the connotation that all views are valid, truthful and right. The second problem with the views of the tolerance crowd is that they will not tolerate the view that someone is right and the others are wrong. You tolerate everyone, but when I say that I am right, my views are not to be tolerated. So, their philosophy is ridiculous. Capice? The Christian viewpoint is the least tolerated, especially if we say that there is a God, there is only one God (Isaiah 45.6), Jesus is the only way to God (John 14.6, Acts 4.12) and that homosexuality is not only unnatural, but a sinful lifestyle (1 Cor. 6.9-12, 1 Timothy 1.8-11, Rom. 1.23-27). A Christian college student called Greg Koukl of Stand to Reason on his radio show and asked his advice on how to deal with a class assignment regarding LGBT lifestyles, and how she could stand up for her faith. (The original broadcast mp3 is here, about 23 minutes, ten seconds into the show.) She called back with a follow-up report and discussion. They noticed how people who want to be "tolerant" were being intolerant themselves, and disrespectful of the beliefs of others. That follow-up call is excerpted below, or you can listen to the original broadcast mp3, at about 2 hrs, 27 minutes, 38 seconds into that broadcast, here.